Jiehong (Joshua) Jiang, a leading researcher and curator in Chinese art, has been conferred with the title, Professor of Chinese Art by Birmingham City University. 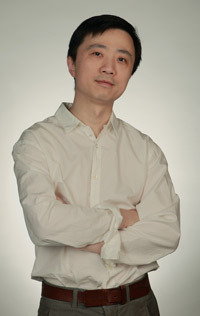 Professor Jiang moved from Shanghai to England in 1998 to continue his postgraduate study for an MA in Fine Art at Birmingham Institute of Art and Design (BIAD), part of University of Central England (former name of Birmingham City University). After completing his PhD in 2002, he continued his research and curatorial practice on contemporary Chinese art and visual culture alongside his teaching contributions to postgraduate courses. Since then, Professor Jiang has set up the Centre for Chinese Visual Arts (www.ccva.org.uk) at BIAD, which constructs a unique academic network with two leading art institutions in China, the Central Academy of Fine Arts in Beijing (CAFA) and China Academy of Arts in Hangzhou (CAA). The centre encourages and develops international and interdisciplinary collaborative research projects of Chinese visual arts and offers academic support and joint supervision within the CCVA International Partnerships for postgraduate and research degree studies. Since 2003, he has also been supervising doctoral studies at BIAD, and broaden his international horizons by developing and delivering the Research Method short course as Visiting Professor at CAA. Throughout his career to date, he has lectured at more than 30 art institutions across China and has published extensively on Chinese art, including the Revolution Continues: New Art from China, A Decade Long Exposure: Chinese Contemporary Photography and Guanxi: A Collection of Letters with Twelve Artists, which won a prestigious book award, 'China's Most Beautiful Book'. Professor Jiang also curates contemporary Chinese art exhibitions in China and the UK, including recently, Collective Identity (Chinese Arts Centre, Manchester; University Museum and Art Gallery, Hong Kong, 2007), the Tale of Angels (Red Mansion Foundation, London, 2009), Beyond Memory: Contemporary Photography in China (CAFA Art Museum, Beijing, 2010) and Guangxi (Guangdong Art Museum, Guangzhou; Today Art Museum, Beijing, 2011). Jiang is currently curating the Fourth Guangzhou Triennial, the Unseen, opening on 28th September 2012, in collaboration with Jonathan Watkins, Director of Ikon Gallery in Birmingham.